In 1839, the Baxter family purchased 200 acres of Crown land, farming it for several generations. Clive Baxter embodies the term “steward of the land”. He is both attentive and responsive to its natural processes, taking proactive steps to improve its health while respecting the ecological systems. Baxter delights in the land’s natural features and feels a strong sense of responsibility to protect and preserve it. “When you live off the land, it has to be an equal relationship, otherwise you’re not going to last long” says Baxter, recounting his family’s farming philosophy which he clearly still lives by today. Strolling along the meandering trails with him, you are treated to a rich historical account of the four generations before, who lived off of and worked with the land. In the 1960s and 70s, with the modernization of agriculture and shift toward large scale mono-cropping, the Baxter family realized their property wasn’t suitable for more intensive farming methods requiring heavy farm machinery. “My Dad thought it was better to plant trees rather than to continue farming – we’ve always loved trees,” recalls Baxter. Partnering with the Ministry of Natural Resources in the late 1970s and 80s, the land was reforested with red pines, tamarack and spruce which now form a dense forest cover, offering cool relief from the hot summer sun and winter winds. The trees also provide important habitat for a diverse population of plants and wildlife. 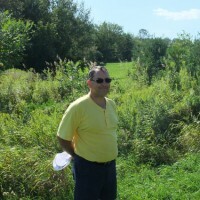 In 1998, Baxter and his father prepared a Conservation Plan with Credit Valley Conservation (CVC) which gave them an inventory of flora, fauna and natural features on the property. Through that Conservation Plan, the Baxter’s received a recommendation to apply for the Managed Forest Tax Incentive Program and the Conservation Lands Tax Incentive Program, from which Baxter enjoys reduced property tax rates to this day. At present, the property is used solely for recreation and enjoyment, a place of solitude. Baxter takes his golden retrievers to the property almost daily because “walking is the human thing to do,” he says. He frequently spends weekends camping there, in a beautiful open meadow.